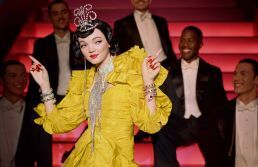 In imagery that recalls the technicolour, on-screen theatricality of the song and dance numbers made famous by talented performers like Gene Kelly, Fred Astaire, Cyd Charisse, Rita Hayworth, Marilyn Monroe, Jane Russell and Debbie Reynolds, this campaign delivers maximum glitz and glamour. Colourful sets with grand stages and staircases alternate with more surreal dream sequence backdrops. The mood is playful, knowing and evokes the joyful outlook of the famous musical films of the 40s and 50s. 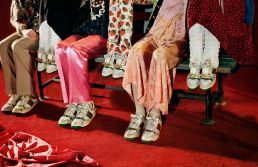 In another set of photographs, Gucci mimics the highly stylised black and white publicity stills created by the studios at the time to promote their stars as perfect role models. A variety of characters from Gucci’s musical are given the silver screen treatment and shot in black and white with dramatic lighting in the style of the many famous movie star portraits by George Hurrell for Warner Brothers Studios and Columbia Pictures in the 30s and 40s. Like those of the period, these pictures exude cool, elegant glamour. The film also pays homage to this famous genre as we see characters dressed in Gucci tap dance, sing and perform synchronised dance routines reminiscent of the work of the exuberant musical choreography of that time. The soundtrack is “There’s No Business Like Show Business”, the song by Irving Berlin written for the musical Annie Get Your Gun and made famous by Ethel Merman in the film of the same name There’s No Business Like Show Business. One of Gucci’s “stars” performs the number.